A $200 million stock offering provides financial flexibility, but it also dilutes investors. After reporting second-quarter results and announcing a $200 million dilutive stock offering, ACADIA Pharmaceuticals, Inc. (NASDAQ:ACAD) fell 13.3% last month, according to S&P Global Market Intelligence. ACADIA Pharmaceuticals launched its first and only commercial drug on May 31, and sales of that drug -- Nuplazid -- are only beginning to trickle in. Last quarter, the company reported just $97,000 in Nuplazid sales, despite its status as the only FDA-approved treatment for Parkinson's disease psychosis, or PDP. The sales pace is unsurprisingly shy of the company's soaring expenses. ACADIA Pharmaceuticals has chosen to launch the drug itself without a large partner, and as a result, hiring and marketing programs caused operating expenses to jump to $72 million in Q2 from $39 million a year ago. 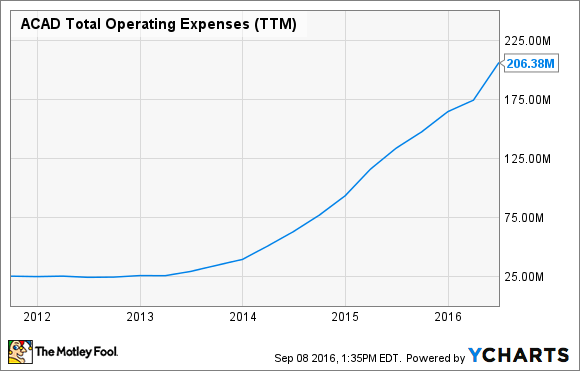 Over the two years, trailing-12-month operating expenses have more than doubled. Since spending in support of Nuplazid's launch isn't about to tail off anytime soon and it could be a while before Nuplazid revenue reaches meaningful levels, ACADIA Pharmaceuticals' decision to tap investors for more funding isn't surprising. ACADIA Pharmaceuticals raised $300 million via a stock offering earlier this year, and management announced another $200 million stock offering in early August. The company's cash and investments stockpile totaled $412 million before its August offering, so it should have enough financial firepower on hand now to last it into 2018. Parkinson's disease psychosis affects about 40% of the 1 million Parkinson's disease patients in the United States, and it's a major cause for Parkinson's disease patients' admittance to nursing homes. Before Nuplazid's approval, a PDP diagnosis resulted in adjustments to standard-of-care dopamine replacement therapy or the off-label prescribing of anti-psychotic medications that can cause side effects and that can be contraindicated in elderly patients. Nuplazid is a potentially better option, but the company needs to increase awareness among doctors, caregivers, and patients, and it has to persuade healthcare payers to pay for it. The drug costs $23,500 per year, and it can take nine to 12 months for private insurers to determine where to place a drug in their drug formularies. ACADIA Pharmaceuticals is negotiating with payers, and a clear pathway to pay for Nuplazid should exist a year from now, but in the meantime, sales could be bumpy because management may need to rely heavily on free samples to keep costs in check for patients. Overall, ACADIA Pharmaceuticals' stock offering is dilutive, but it does provide the financial footing necessary to build momentum for Nuplazid. Nuplazid's addressable market makes this stock intriguing, and while I don't own shares in it currently, I have added it to my watch list.